A FLOAT trip down the Pacific Highway is almost a weekly occurrence for Morisset trainer Mark Callaghan these days. He struck gold on Saturday night when promising pacer Itz Georgiaonmymind scored the omen victory of US Masters week, soaring to a two-metre victory over Rock Bottom and Young Cambo at Menangle on Saturday night with a 1:54 mile. The shrewd horseman has made sure his trips to Sydney are not in vain, booking premier reinsman Todd McCarthy to handle his horses whenever he hits town. Callaghan heads back to Menangle today and must fancy his prospects of at least a winning double, given McCarthy’s outstanding form, which returned him five winners at the south-western Sydney track on Saturday night. 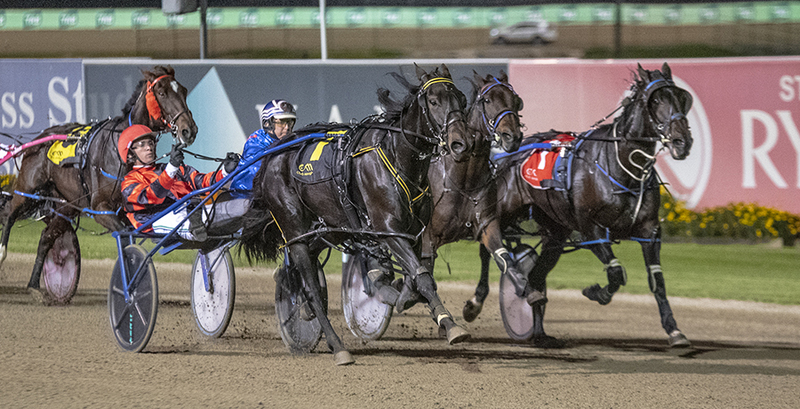 The pair team up with three strong chances, including two likely favourites at Menangle. The best of those looks to be promising gelding Royal Gamble, who has picked up a cheque every single one of the eight times McCarthy has driven the son of Bettors Delight, including a Menangle win in 1:53.6 last month. Drawn wide on the track today, Royal Gamble has been kept safe in the betting by the TAB and has been listed a $3.50 favourite. Todd will also partner $4.50 equal favourite Lovin Miss Daisy in Race 6. This mare also has an amazing record with Todd in the bike, winning once but earning a cheque every time Todd has driven him. Drawn gate four today, Lovin Miss Daisy will need to be at her best to beat a smart field, including one-time Miracle Mile contender Charlaval. Callaghan also has McCarthy driving unraced filly Our Von, who opens her campaign in Race 2 but is bound to be well fancied following a handy trial win at Newcastle last week. Meanwhile Callaghan is taking his time with Itz Georgiaonmymind, who will race her way through the grades and should be a frequent Menangle visitor as well. “She broke a pedal bone after her first few runs for us and has come back nicely,” said Callaghan. “She is finding confidence and is improving with each run, which is a good sign. “I’ve got no real set plans with her and I’ll just see how she pulls up over the next few days. “I think she can get through the grades quite well now. “After her heat win to make Saturday night’s final I kept her reasonably fresh and only gave her one trial, which had her in good shape for the final.